Some reflection on things from Lincoln. Two new ones from Moka Only. The NTF crew connect with Scion for a DJ Dopey-orchestrated mix of their Target Market [Recoil] album + the release of a bunch of remixes and newness. Catch them with Your Old Droog, Thursday February 21st @ Tattoo (567 Queen Street West). And another dope show for tonight. 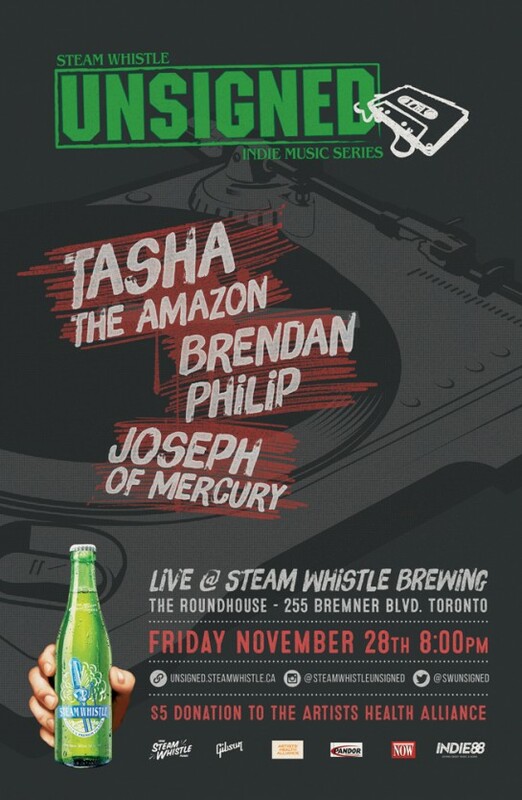 For our 30th edition of Steam Whistle Unsigned Series we’re bringing in plenty of homegrown talent. From Tasha the Amazon to Brendan Philip and Joseph of Mercury. There’s plenty of opportunity to discover new genres in support of Artist Health Alliance. We’re proud to be bringing on board Tasha the Amazon, the wild and unapologetic MC with tribal influences stemming from Jamaica. We’ll be welcoming Toronto producer Brendan Philip, whose soulful blend of ambient pop has backed artists tracks ranging from The Weeknd to James Blake. They will be joined by Joseph of Mercury – who’s soulful yet powerful presence could make him the musical love child of Chris Issac and Morrisey. Much like Toronto our 30th edition of Steam Whistle Unsigned provides a diverse array of musical acts and genres. Giving fans the chance to explore new music in one awesome night with all proceeds from the ticket sales going directly to Artists Health Alliance. Another dope event in the city to check out this weekend. Shouts to R.I.S.E.! On Sunday November 30th, 2014. We will be celebrating the closing of our ‘Edutainment Month’ with our annual Celebration Concert taking place at the Ada Slaight Hall inside the Daniels Spectrum. Looks like the making of a nice night tonight at the Garrison. Haven’t seen Jazz live yet so def gonna try and reach. Shouts to Dalton Higgins! 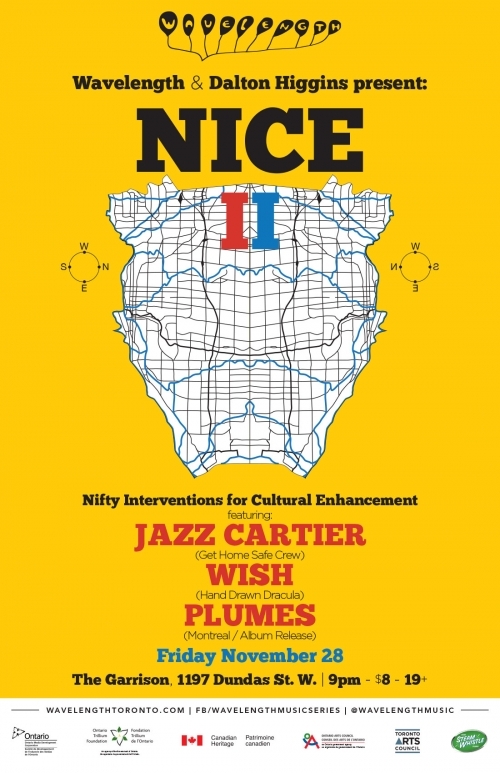 Back in April, Wavelength’s Jonny Dovercourt and co-conspirator & global/urban music promoter Dalton Higgins put their heads together to bring you the first “NICE” party (“Nifty Interventions for Cultural Enhancement”). The multi-genre culture clash aimed to create a live showcase that better reflected the musical and demographic diversity of the city – and the people came, and saw that such a thing was possible, and awesome. With a new Mayor of Toronto elected and a different leadership style to be deployed… now what? We can’t predict what will happen at City Hall, but we can say that NICE II will happen Nov. 28 at the Garrison, and will include hype rapper Jazz Cartier (Get Home Safe Crew), slack-rockers Wish (Hand Drawn Dracula Records) and Montreal chamber-pop crew Plumes (album release tour). Plus more NICE-ness to come!! Watch Jazz Cartier’s “Switch/The Downtown Cliché” video premiere on The Fader. Stream Wish’s debut album on Consequence of Sound. @ The Garrison, 1197 Dundas St. W.
Tickets $8 advance at Ticketfly. 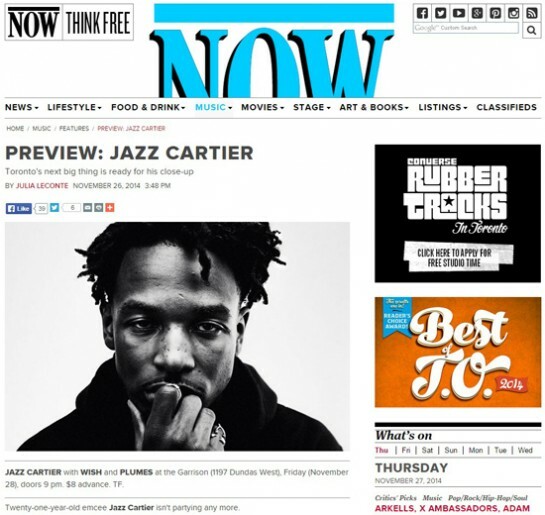 NOW chops it up with Jazz Cartier in advance of his show tonight at the Garrison. Get to know the kid. Twenty-one-year-old emcee Jazz Cartier isn’t partying any more. With his deep, raggedly emotional and versatile vocals, and his go-to producer, Michael Lantz, lending menacing industrial-electro beats, Jazz has made some anthem-ready tunes already. People do love Set Fire and Switch/The Downtown Cliché, but he doesn’t need to party to know that. Instead, the rapper, whose real name is Jaye Adams, spent last weekend with his girlfriend, baby shopping for his expecting pal and falling asleep to movies. It’s a nice change, especially after two years in the three-floor, five-bedroom Kensington Market abode he shared with his Get Home Safe crew – a notorious party (and after-party) spot somewhat ironically called the Palace. Jazz was born in downtown Toronto but started moving around the world (Idaho, Barbados, Kuwait) when he was six – his stepdad works for the U.S. government. Eventually he landed in an elite boarding school in Connecticut where he played tennis and snuck into 50 Cent’s estate with his friends on his downtime. After graduation, he was supposed to go to school in Chicago, but to the chagrin of his mother, came back north. Theo3 lets off the DJ Pack for his latest 4-cut release, Payin’ Hommage. DL below! 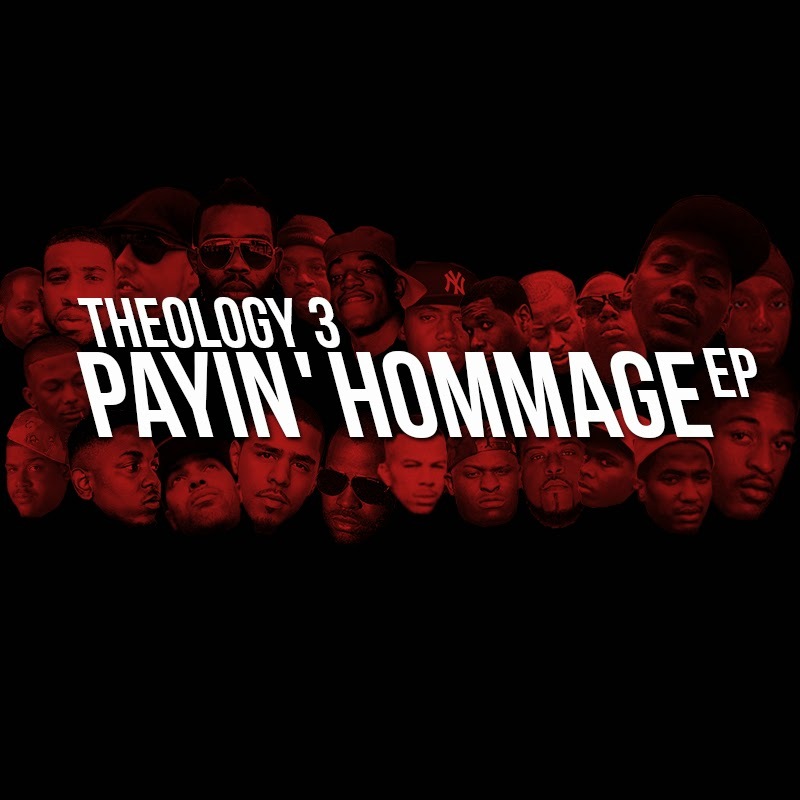 Toronto Emcee THEOLOGY 3 (Stylistik 89.5fm, Freedom Writers, Camp X) is proud to release this content driven, hard driving project for public consumption reflecting on a wide variety of social issues, aggressive lyricism and musically diverse beats. From the innovative chorus of PAYIN’ HOMMAGE featuring the precision cuts of DJ Thera P blending some of Theo3’s “Favourite Lines” to the controversial smack down ofWHITE TRASH detailing the blame driven, reactionary musings of many racist people in all economic and social settings, this record is not to be missed. Additional production is provided by highly regarded producerAMIR (Drake, Shad) and multi instrumentalist SY WYLD (Arabesque). To support all Theology 3 releases visit www.Theology3.com and pick up one of the many critically acclaimed projects with collaborators including TONY TOUCH, DJ ECLIPSE, AUDIBLE DOCTOR, The FREEDOM WRITERS, PSYCHO LES and more. Thank YOU. Urbanology Magazine releases promo visuals supporting “The Reason”, a multimedia production “uniting six young voices to tell one narrative as they Speak Out On Violence”. 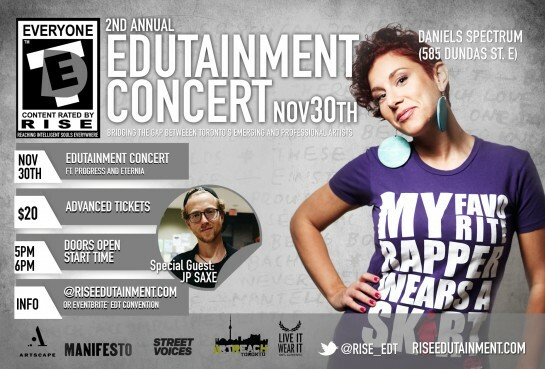 It takes place today, November 27th at 7pm @ The Paintbox Bistro: 555 Dundas St E. Admission’s free. Full visual credits after the jump! New Kardi visuals setting a contemplative tone for his upcoming “Kardi Gras” EP. And don’t forget it’s almost that time for his 12th annual Christmas fundraiser… The Kardi Party goes down this year on December 18th @ The Everleigh. 580 King St W.